As fluency in English increases across generations, so, too, does the regular use of English by Hispanics, both at home and at work. For most immigrants, English is not the primary language they use in either setting. But for their grown children, it is. The surveys also find that Latino immigrants are more likely to speak English very well, and to use it often, if they are highly educated, arrived in the United States as children or have spent many years here. College education, in particular, plays an important role in the ability to speak and read English. Among the major Hispanic origin groups, Puerto Ricans and South Americans are the most likely to say they are proficient in English; Mexicans are the least likely to say so. The transition to English dominance occurs at a slower pace at home than it does at work. Just 7% of foreign-born Hispanics speak mainly or only English at home; about half of their adult children do. By contrast, four times as many foreign-born Latinos speak mainly or only English at work (29%). Fewer than half (43%) of foreign-born Latinos speak mainly or only Spanish on the job, versus the three-quarters who do so at home. First: Those born outside the United States; includes those born in Puerto Rico. Second: Born in the United States, with at least one first-generation parent. Third and higher: Born in the United States, with both parents born in the United States. The main data sources for this report are six surveys conducted for the Pew Hispanic Center from April 2002 to October 2006. They included interviews with more than 14,000 native-born and foreign-born Latino adults, ages 18 and older, irrespective of legal status. Latinos born in Puerto Rico, many of whom arrive on the U.S. mainland as Spanish speakers, are included as foreign born. In analyzing the data on English use and prevalence from these surveys, this report relies on four measures based on respondents’ ratings of their English-speaking skills, their English-reading skills, their level of English use at home, and their level of English use at work. Two of these surveys, along with a more recent nationwide survey of Latinos taken by the Pew Hispanic Center in October and November of this year, also provide a clear measure of how Hispanics believe that insufficient English language skill is an obstacle to their acceptance in the U.S. In surveys taken in 2007, 2006 and 2002, respondents were asked about potential sources of discrimination against Hispanics. In all three surveys, language skills was chosen more often than the other options as a cause of discrimination. Of adult first-generation Latinos, just 23% say they can carry on a conversation in English very well. That share rises sharply, to 88%, among the second generation of adults, and to 94% among the third and higher generations. A majority of foreign-born Hispanics (52%) report that they speak only Spanish at home. That is true of just 11% of their adult children and of 6% of the children of U.S.-born Hispanics. Half of the adult children of Latino immigrants speak some Spanish at home. 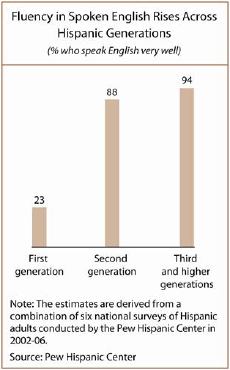 By the third and higher generation, that has fallen to one-in-four. Nearly three-quarters of Mexican immigrants (71%) say they speak English just a little or not at all. Respondents born in South America (44%) and Puerto Rico (35%) are the least likely to say they speak English just a little or not at all. College education is closely tied to the ability to speak and read English. Among Hispanic immigrants with college degrees, 62% report that they speak English very well. That share drops to 34% among those with high school diplomas and 11% among those who did not complete high school. Immigrants are more likely to speak English very well, and to use it often, if they arrived in the United States as children or have spent many years here. Most Latino immigrants (67%) report that they use at least some English at work. Just 28% say they speak only Spanish on the job. Most Hispanics who are naturalized citizens (52%) speak English very well or pretty well. Most non-citizens (74%) speak just a little English or none at all. More than four-in-ten (44%) Latino adults—both foreign born and native born—are bilingual. This is especially true of the adult children of immigrants: More than two-thirds (68%) report that they can carry on a conversation in English or Spanish pretty well or very well. Latinos cite language skills more frequently than immigration status, income/education or skin color as an explanation for discrimination against them. In 2007, 46% said it was the biggest cause of discrimination against Latinos. The estimates in this report are derived from six surveys conducted for the Pew Hispanic Center from April 2002 to October 2006. They included interviews with more than 14,000 native-born and foreign-born Latino adults. The report relies on respondents’ ratings of their English-speaking skills, their English-reading skills, their level of English use at home, and their level of English use at work.